This may be the most beautiful cookbook in my (large) collection.Mouth-watering photographs on heavy slick paper show each dish in a simple setting with a bite or slice taken out and a spoon or fork handy, making you long to reach in and grab the next bite for yourself.Recipes are interesting, simple, and clearly laid out in numbered steps.Measurements are given as:25g/1oz/2 tbsp.Each recipe has a page to itself with a short introduction giving a little history of the dish along with its Welsh name.Much too short at about 100 pages, this book is armchair travel heaven for those of us who long to taste what's unique about the food in each place we visit.Warning:will make you hungry! This is a beautiful cookbook filled with loads of recipes that actually work. The recipes are well written and are easy to follow. This book is filled with pictures that entice you to run to the kitchen and start cooking and baking.I love that this book has a little introduction with every recipe, it makes it fun.It is a very interesting read from cover to cover and is well worth the price! 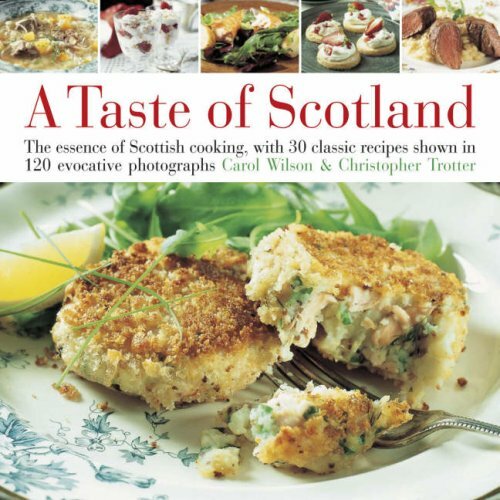 If you like Scottish food, sweets in particular, this book is for you! We have made virtually all of the baking and sweet recipes in this book, and they are all delicious. Do you like Tiramisu? I did not think anything could top that, but then I tried the recipe in this book for Cranachan -- oh, my! Who'd of thought that cream and raspberries and honey could mix with some other delightful things and be so incredible? The breakfast pancakes, with lime juice flavored golden syrup as a topping -- amazing! Real maple syrup pales in comparison. And fresh from the oven Baps and eggs for breakfast -- yum! You'll need to buy some Lyle's Golden Syrup and some Lyle's Black Treacle for most of the baking recipes, but it is SO worth it! We've only made one meal recipe, to date, which is the Scotch Broth. For soup/stew lovers, this one is a hearty bunch of comfort food. Eaten with some warm, crusty wheat rolls, on a cold winter's evening, you are definitly feeling some endorphins flowing! 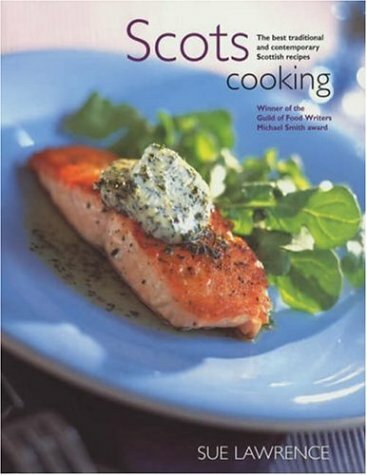 Over a hundred of the best traditional Scottish recipes have been collected for Scots Cooking by Scottish author Sue Lawrence from her home country, and uses the fresh and diverse local ingredients for which Scotland is so famous. Anticipate many dishes holding seafood and meats, and presenting flavor combinations not to be found in other cookbooks; such as the Orkney dish Clapshot. People who have read my other reviews of cookbooks will know that I grew up around restaurants (my grandfather's)and that I am an avocational home cook and avid but selective cookbook collector.My wife and I grew up in the Northeastern United States and much of our childhood cooking was in the British tradition.For an upcoming return tour of England we wanted to learn more about this cuisine, particularly its iconic dishes.Based upon earlier reviews, this book came at the top of my list and I was not disappointed.So many of the recipes made my mouth water and seemed familiar in a comfortable way.Even before our American interest in local ingredients and local foods, British cooking led the movement.The dishes in this book are just the ones to recreate using quality ingredients produced close to home. Persons who have ever wondered what "pease porridge" was in the old nursery rhyme will find a tasty recipe here.Travellers who might be put off by a dish like "Cullen skink" will find that they are facing a soup of haddock in creamy milk that is quite appealing.There is a whole chapter devoted to "teatime" and its foundation dishes such as cucumber sandwiches, sweet quick breads, scones and so on.Scotch eggs (eggs wrapped in ground sausage bound up with flour and deep-fried) are one of our great picnic foods and one of England's classic pub offerings.How about sweets like lemon curd and real mincedmeat pie filling?There are great "pickles" like orange chutney.If these dishes appeal to you, do buy the book. My hardcover purchase dates from 1981 and there are no photos to whet the appetite but the food itself does enough of that.This book is a keeper, even after our tour is over. I like to cook but don't have as much time for it as I'd like. I can do the recipes in this book on the weekends, but on workdays, they just take too long. That's too bad, because the food is very good. 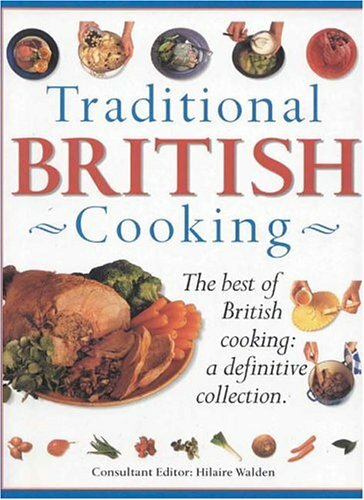 Although the book has no pictures, the recipes taste and look like authentic British foods.The measures have been converted to standard American measures and sometraditional British ingredients have been changed to easier to find American ingredients such as sour cream instead of creme fraiche; however, this book would be easy to use in any country.A good basic 'What the English really eat' cookbook! 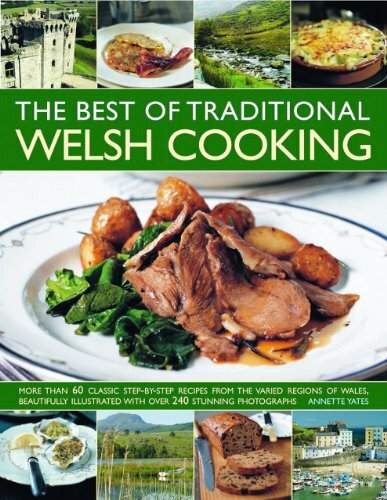 The delight in this book is not only in the recipes, which I have enjoyed immensely. Jane Garmey's wit in the presentation makes one sense a wink at the poor reputation British food generally holds, just as her recipes give it the lie. Generally, British food at its best is wonderful... trouble is that finding it 'at its best' often requires a journey. The volume is not exhaustive, but presents many classic dishes, most easily prepared (and some which would appeal to, for example, one so avidly traditional as to spend the two months it takes for genuine plum pudding.) It is a pleasant sampler of varied main dish, savoury, pudding, and tea favourites. This is a beautifully produced book with a nice variety of recipes (33 in all), in a convenient size. 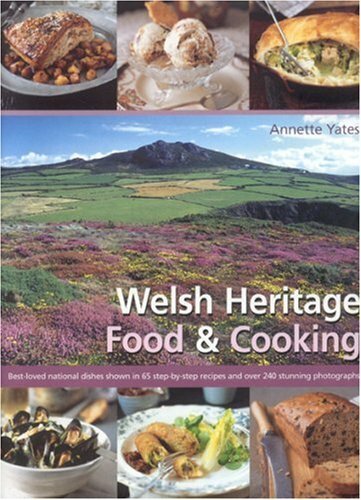 However, owners of Annette Yates' Welsh Heritage Food & Cooking beware - every recipe in A Taste of Wales is also in that one, although WHF&C has many recipes not included here (64 recipes in total). 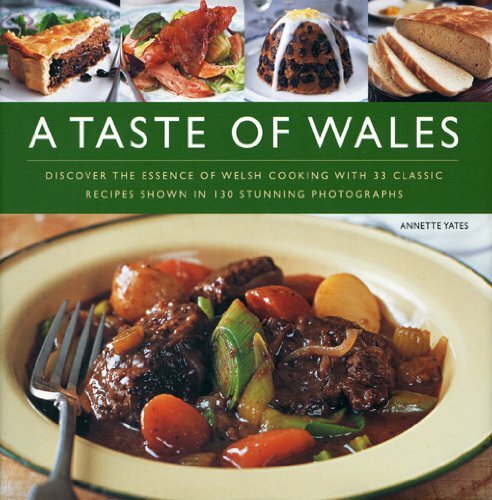 Also, in A Taste of Wales, the introduction has been sadly curtailed to a mere 2 pages. Like the earlier WHF&C, this book includes calorie & nutrition information for each recipe, but is divided into broader sections: Introduction; Appetizers, Light Meals & Breakfasts (7 recipes); Main Courses (16); Puddings (5); Breads & Cakes (5). It's illustrated with the same photos as WHF&C, but in a much smaller size. 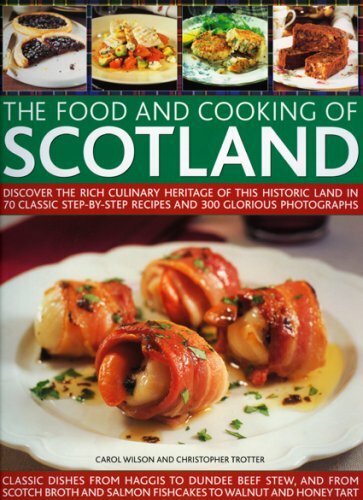 In this comprehensive cookbook, you will learn about the glories of shortbread, or Scotch cake, a unique Scottish creation, as well as marvelous rock buns and Dundee cake. Find out how the Scots introduced fried chicken to America and enjoy recipes for happit hen, wet devil, and Scotch grouse. Digest the histories of the Campbell Soup company, Old Crow Bourbon whiskey, and the graham cracker, invented by the eccentric clergyman Sylvester Graham. Try your hand at innovative egg dishes, fish pies, Scottish hot dogs, oatcakes, scones, griddle breads, and crumpets. Finally, make an ale toast at Hogmanay (New Year's Eve) and ring in the New Year celebrating the many Scottish-American contributions to our daily lives. 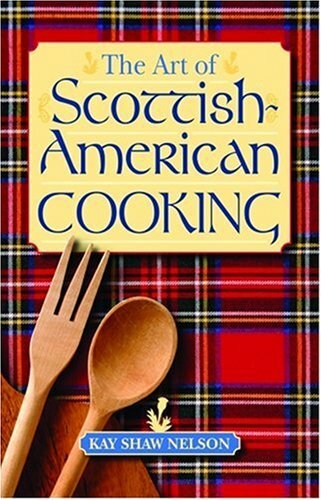 I really like this cookbook.The recipes are more American than Scottish, but I have yet to find a dud.The author had been diligent to include recipes from all of the portions of the US that have large Scottish populations.She provides some details of each place, and this makes for interesting reading.This book is pitched toward the person who is comfortable in the kitchen, but who is not an expert. Sure, British food can be stodgy, but it can also be wonderful -- mainly in a comfort-food sort of way. If you have visited England, you might have an occasional yearning for traditional British food, such as a Full English Breakfast, or a shepherd's pie, or fish and chips (with mushy peas, a meal component we never see here). And nobody does dessert the way the British do: summer pudding, treacle tart. This book is chock full of those recipes and about 150 more. And it's really, really good. 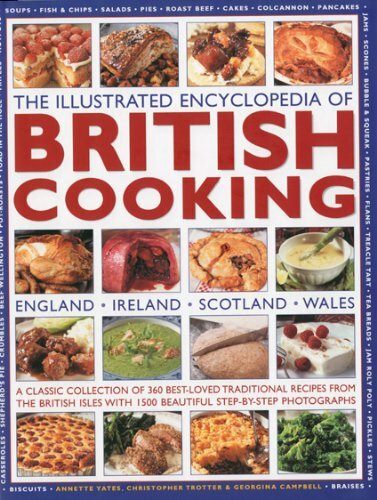 Unlike some British cookbooks, which appear to believe that herbs and spices are irrelevant, this book celebrates flavor; in fact, the book starts out with a introductory section about the history of food (the arrival of coffeehouses in the 17th century) and regional delicacies (from Maldon salt to kippers from the North Sea). 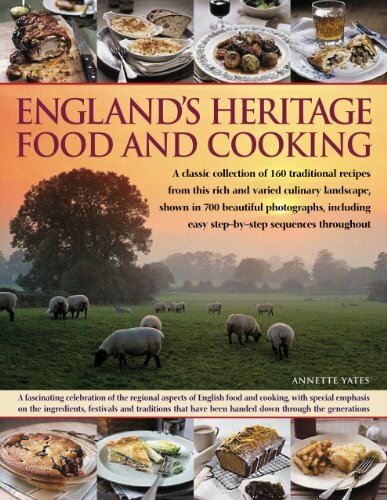 A section on The English Kitchen describes common ingredients, some of which are hard to find here: borage, watercress, gooseberries. (Most ingredients used are available in your local grocery store, though.) Nothing wimpy here. One thing I *really* appreciate -- and is a selling point for me -- is that every recipe has nutritional information: calories, protein, carbs, cholesterol, etc. Mostly, this is reassuring; the chicken and ham pie I have my eye on is only 431 calories, which means it'll fit into my diet. And at 731 calories, the full English breakfast (potatoes, grilled tomatoes, toast, sausages, bacon and eggs) assuredly will _not_. But that doesn't keep me from drooling over the pictures. Great Camp Cookin!And only getting better! A treasury of delectable recipes, Celtic Folklore Cooking by Joanne Asala will help you select foods to serve at your celebrations of the Sabbats and Esbats: the festivals and ritual times for Witches and Wiccans. It is also a terrific introduction to Celtic culture. 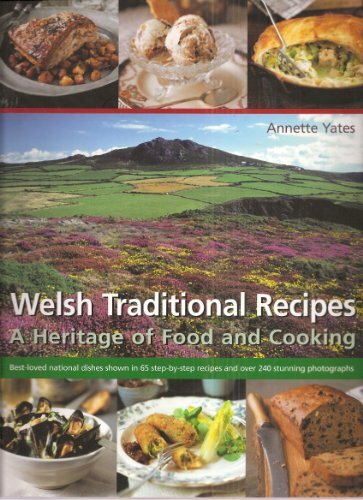 The recipes in this book were gathered during four trips the author took to Ireland and Britain, as well as visits to Scotland and Wales. She searched for people who still cooked in the traditional of their ancestors, passing down recipes from generation to generation. The result is a book that is rich in Celtic tradition. And the foods are delicious any time, too! The ancient Celts celebrated their Sabbats with music, dance, games, food, and drink. Whether you are a solitary practitioner or a part of a larger group, food and drink should always be a part of your festivities, rituals, and ceremonies. This book can be the key to a wide variety of foods that will make you the talk of the town! If you are involved in Celtic traditions, this book is a must. If you simply like unique recipes for foods that are as tasty today as they were hundreds, even thousands of years ago, you'll want this book, too. As a Christian, I believe one of my responsibilities is to be respectful of other religions.This being said, I found the discussions on Wicca as enriching as the tales and the food, and I learned to appreciate the Wiccan culture which provided us with mistletoe in Advent and Christmas and the hot cross bun on Good Friday.As an American of Irish ancestry, I was fascinated with the Irish tales that accompany many of the recipes, some of which produced in me laughs as hearty as a good bowl of stew. I found the recipes being grouped according to the Wiccan seasons helpful because it seems as if the Wiccans have a great respect for the earth and for agriculture; from Asala's perspective, food that may be appropriatePentecost in May or June may not be so at around the time Christmas is celebrated and vice versa. From a health perspective, many doctors, including my friendArlene Alexander, M.D., the sister-in-law of InterVarsity's founder John Alexander, and Neal Barnard, M.D. have considered oatmeal very beneficial to one's heart, yet even when I was vacationing in Ireland, I have avoided oatmeal simply because I do not like sweet things for breakfast, or have considered oatmeal boring.Asala's BrotchanFoltchep (Leek and Oatmeal Soup) has completely transformed the way I look at oatmeal.In keeping with Barnard's teachings against mammal products, I find this recipe easily modifiable by substituting mushroom broth for the whole milk or beef stock mentioned, and olive oil for the melted butter, even though olive oil may not have been readily accessible in Ireland prior to 1500. This is an excellent feast for the body, mind, and spirit - and not just for St. Patrick's Day! 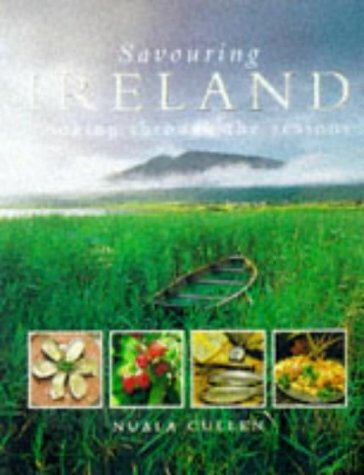 Great recipes but it is a cookbook.Regarding the celtic connections I think the book does not have enough information.Good read. First, the folklore elements to this book were somewhat laughable, particularly the bit about "heather wine. "For those who want to know the folklore behind this, the story is called "The Viking Ale" or "The Scottish Ale" depending on version, and is the subject of one of the studies in Viking Ale: Studies on Folklore Contacts Between the Northern and the Western Worlds by Bo Almqvist.It's a pretty cool story, but bears no resemblance to the discussions in that book. (Almqvist suggests that the story is in fact a Celtic tale inspired by portions of the Volsung Saga, which might have been heard by Irishmen or Scotsmen from Vikings). 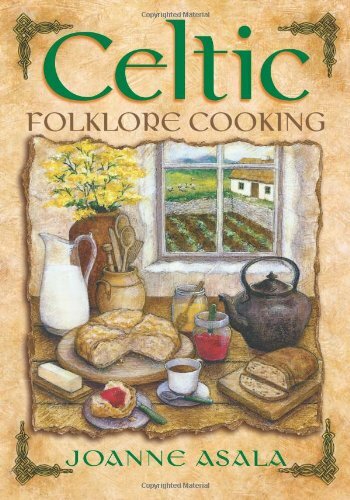 So it's not really based much on folklore.And with all the nutmeg and other exotic spices, I can hardly call it Celtic.But it is cooking so I suppose one of the three words in the title is correct. This being said, despite the misleading title, I suppose this was a book that was supposed to give Wiccans some creative cooking tips for neo-Celtic-themed dishes to serve during get-togethers and maybe some inspiration into how to weave herbal folklore into cooking.I suppose for that it's not so bad. The book could use a proper title, such as "Wiccan cooking. "That might help prevent some people from being disappointed. I rated this 3 stars because I suppose some people will get some use out of it (I won't). 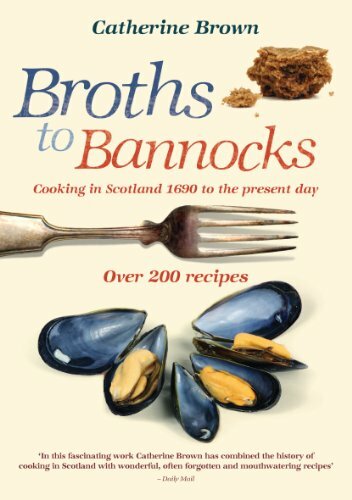 This book is yet another insult to Celtic culture, in disguise as a "cookbook". Some of these recipes aren't even Celtic, and the "ancient folklore" she cites has nothing to do with the recipes. The only vaguely valid recipes are the bannocks for certain holidays. Otherwise, it's just a conflagration of Neo-Wiccan nonsense. Even in the intro she tries to present some sort of Matriarchal Great Goddess story, and then associate the ancient Celts(how many times do we have to kill this myth before it dies?). The word "Celtic" is only in the title to win the favor of the gullible New Agey type. 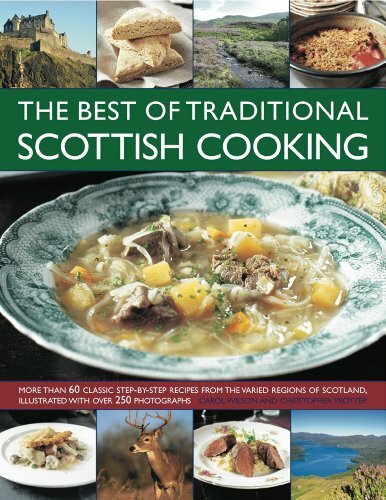 If you want a Celtic cookbook, go buy one. If you want a load of New Age tripe, go buy that. But for the sake of all that is holy, haven't the Celts suffered enough?? I was hosting a couples shower and they requested "Pub Food"I knew they had never been to England but wanted to expose them to new sensations so I fixed both English and American Pub Grub. The recipes were easy to follow and ingredients easy to obtain in the Los Angeles area.Good Book!! This big, beautiful book is glossy and lush.It has full color photos throughout, showing each delightful recipe in all its glory.All the traditional favorites are in here, and several more that you will want to try.This is the kinds of recipe book that makes you hungry, and it inspires you to get in the kitchen.Enjoy! Some of the recipes are from my childhood days which I had forgotten. The rest of the recipes are great. 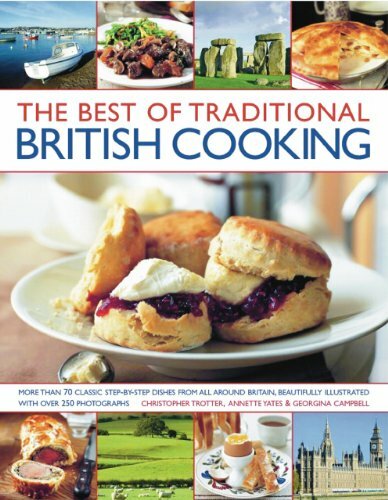 This cook book combines the old and the new of British cooking. I would recommend this cook book for anybody home sick for your mothers cooking.